Carrots have a reputation for being difficult to germinate, and producing misshapen, branching roots. Carrots are some of the best crops to grow in the backyard veggie patch. The flavour of freshly harvested carrots is so vastly superior to the shop-bought varieties that once you've grown your own you'll wonder why you ever bothered with those tough, woody, plastic-bagged orange pegs that dare to call themselves carrots. Carrots really hate being transplanted, so they're best grown from seed sown directly into the garden bed in rows that are about 20-30 cm apart. Yates has six carrot varieties to choose from in its seed range: Baby, Early Chantenay, Egmont Gold, Express Hybrid, Manchester Table and Topweight. Sow radish seeds among the carrots. These will emerge first and break the soil surface for the slower-germinating carrots. They will also be ready to harvest well before the carrots are mature. Press carrot seeds into the soil surface. Cover with sieved cypress needles or mushroom compost. Dissolve a pinch of epsom salts in water and pour over the rows. Float seeds in kerosene for 2 minutes. Pull straight out and drain. Mix seeds with dried tea leaves before sowing. This repels ants and keeps seeds moist. After sowing, rake soil into a 2 to 5 cm high ridge over the row. Rake excess away after a week (the theory is that the extra soil will improve moisture levels around the seed). Grow carrots in soil that is deep, even and well-drained. Hard, lumpy or gravelly soil will encourage each root to fork in many directions. 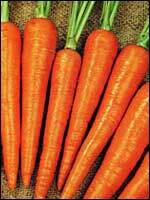 Grow carrots in soil that has been well fertilised for a previous crop. Pockets of fresh manure or fertiliser will encourage roots to branch. Grow short varieties (like Yates Baby). In warm and temperate areas, carrot sowing can start now, and new sowings can be made every few weeks. In cool climates, it's best to wait until spring has well and truly arrived, because carrots react badly to cool temperatures in their early stages of growth.